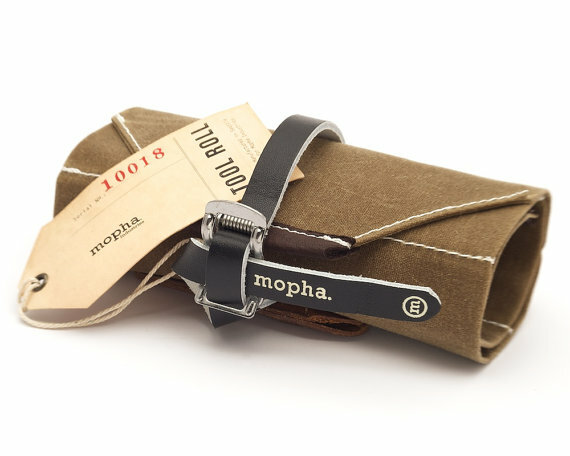 The Mopha Tool Roll is a super cool new way for cyclists to deal with the flats etc. on the road and well we can't really describe it better than they do so..."born out of a desire by a few members of a group of cyclists, known as Mopha, who wanted a simple and highly functional way to carry their cycling tools. Working from their inspiration, and harkening back to the simplicity and quality of days gone by, we delivered a straightforward form comprised of rolled canvas, leather trim and vintage toe strap to reveal maximum function. No more chaffing velcro, synthetic zippers and fabric, or black-hole searches through something manufactured far from home." Available here.